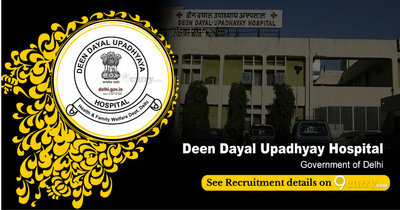 DDU Hospital Recruitment 2019: Deen Dayal Upadhyay Hospital (DDUH), Delhi Govt. is conducting recruitment processes to fill 20 vacancies. As of now, there is one recruitment drive going on for Walk in for 20 Jr. Resident Posts. DDU Hospital Recruitment 2019 - Walk in for 27 Sr. Resident Posts in DDU Hospital, New Delhi on Regular Basis. Candidates are invited by Deen Dayal Upadhyay Hospital (DDUH), Delhi Govt. to attend walk-in-interview to be held on 16 Apr 2019 09:30 AM for 27 vacancies. DDU Hospital Recruitment 2019 - Job notification for Junior Resident Posts in DDU Hospital, New Delhi on Regular Basis. Applications are invited by Deen Dayal Upadhyay Hospital (DDUH), Delhi Govt. on or before 16 Mar 2019 till 04:00 PM for 4 vacancies. DDU Hospital Recruitment 2019 - Walk in for 10 Sr Resident Posts in DDU Hospital, New Delhi on Regular Basis. Candidates are invited by Deen Dayal Upadhyay Hospital (DDUH), Delhi Govt. to attend walk-in-interview to be held on 26 Feb 2019 at 09:30 AM for 10 vacancies. DDU Hospital Recruitment 2019 - Walk in for Sr. Resident Posts in DDU Hospital, New Delhi on Regular Basis. Candidates are invited by Deen Dayal Upadhyay Hospital (DDUH), Delhi Govt. to attend walk-in-interview to be held on 25 Feb 2019 at 09:30 AM for 8 vacancies. DDU Hospital Recruitment 2019 - Walk in for Sr Resident Posts in DDU Hospital, New Delhi on Regular Basis. Candidates are invited by Deen Dayal Upadhyay Hospital (DDUH), Delhi Govt. to attend walk-in-interview to be held on 18 Jan 2019 at 09:30 AM for 9 vacancies. DDU Hospital Recruitment 2018 - Walk in for 24 Sr Resident Posts in DDU Hospital, New Delhi on Regular Basis. Candidates are invited by Deen Dayal Upadhyay Hospital (DDUH), Delhi Govt. to attend walk-in-interview to be held on 14 & 17 Dec 2018 from 09.30 A.M. to 12.00 Noon for 24 vacancies. DDU Hospital Recruitment 2018 - Walk in for 23 Sr Resident Posts in DDU Hospital, New Delhi on Regular Basis. Candidates are invited by Deen Dayal Upadhyay Hospital (DDUH), Delhi Govt. to attend walk-in-interview to be held on 03 & 04 Dec 2018 09:30 AM to 12:00 Noon for 23 vacancies. DDU Hospital Recruitment 2018 - Walk in for 24 Jr Resident Posts in DDU Hospital, New Delhi on Regular Basis. Candidates are invited by Deen Dayal Upadhyay Hospital (DDUH), Delhi Govt. to attend walk-in-interview to be held on 22 Nov 2018 for 24 vacancies.